High performer. 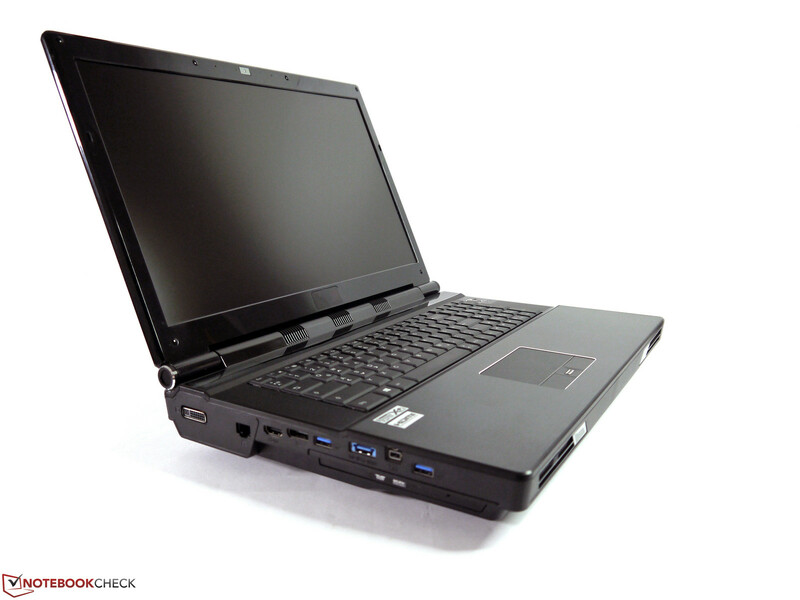 Schenker's XIRIOS W712 workstation features superlative performance components. Intel's Xeon desktop CPU, Nvidia's Quadro K5000M pro-graphics, 2 terabytes of storage and a wealth of other equipment clearly show the high-end laptop's direction: The peak of performance. We exhaustively tested whether this goal is achieved. 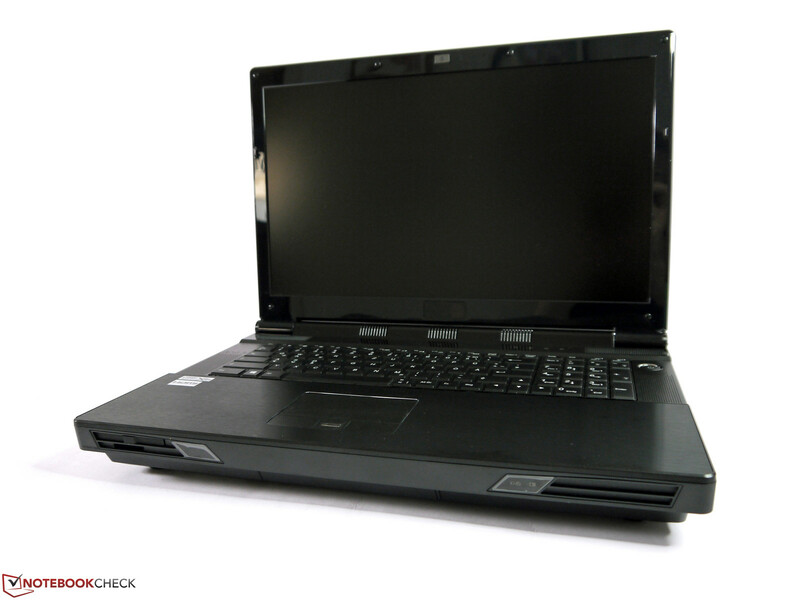 Schenker's XIRIOS W712 is based on the same barebone chassis (Clevo P570WM) as Schenker's XMG U702. The configuration details of both series are very similar. They only differ strongly in the availability of Nvidia's professional Quadro K5000M graphics in the XIRIOS W712 models. The options for customizing the workstation are vast. 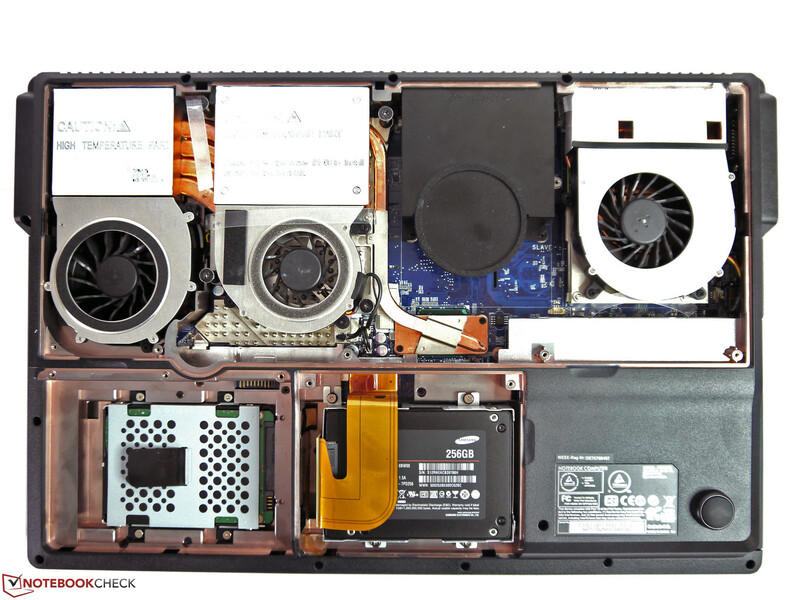 The established workstation contenders from Dell, HP, Fujitsu or Lenovo do not offer the possibility to order desktop CPUs or three standard 2.5-inch storage devices. Our test configuration sports Intel's Xeon E5-2680 CPU, Nvidia's Quadro K5000M GPU, 32 GB of RAM, a 256 GB solid state drive and two one-terabyte hard drives. The price of this configuration added up to 5860 Euros (~$7594) at the time of this review. The gigantic casing reaches a weight of a good 6 kilograms (13.2 pounds). The nearly 1.5 kilogram (3.3 pound), power supply will also always be carried along because the battery runtime of about one hour is very tight. A weight of 8 to 9 kilograms (17.6 to 19.8 pounds) is quickly achieved along with a few peripherals and a bag. 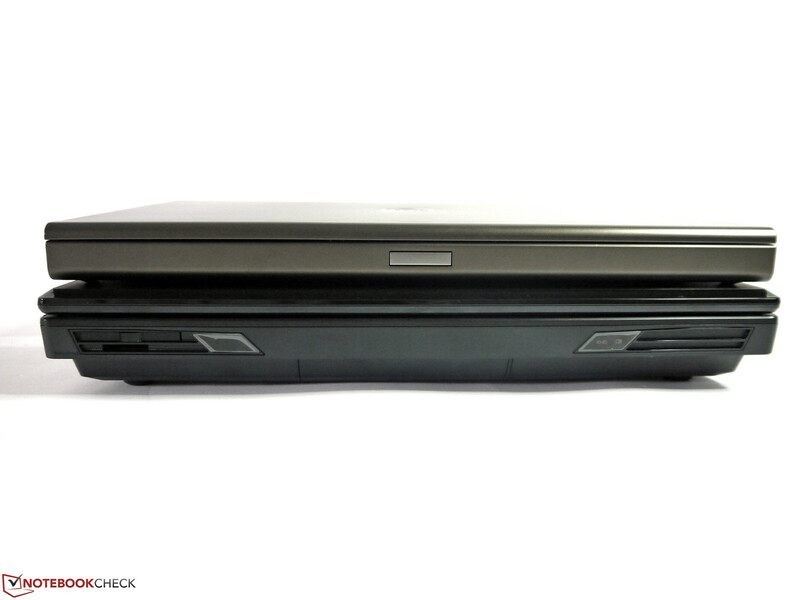 In return, the user gets a very rigid and solidly built chassis. Nothing can be dented or twisted. The feet are solid and provide enough space to the surface, which ensures proper air circulation. The battery is fastened with three screws. It should not be removed in stationary use because one of the feet needed for a secure placement is mounted to it. 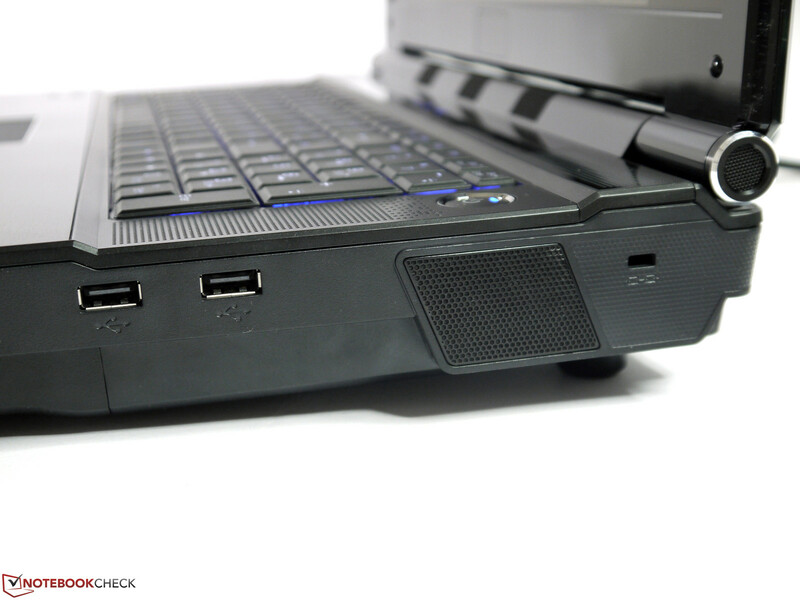 The wrist rest is coated with brushed metal and enhances the otherwise dull plastic casing. 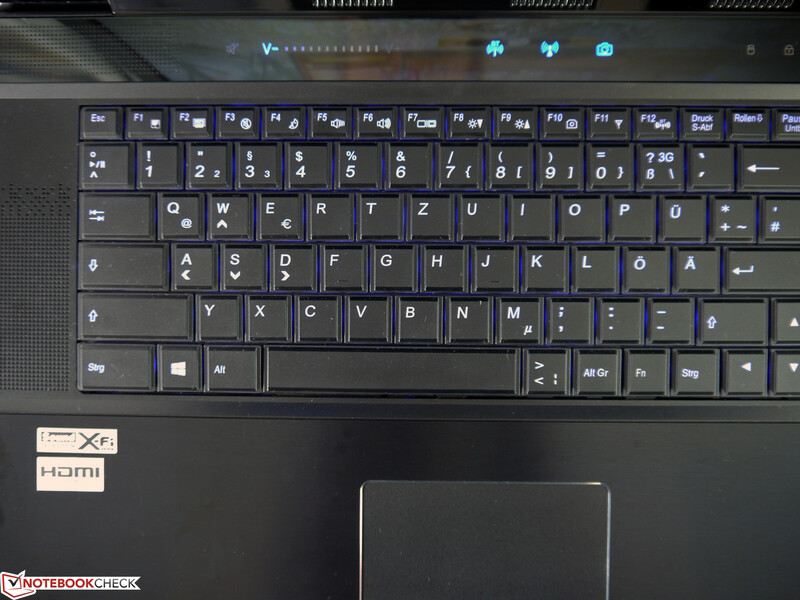 The transparent status bar with LED icons between the keyboard and screen is also appealing. On the other hand, the display lid twists easily and, depending on the ambient light, its black high-gloss finished frame can get annoying. Reflections, fingerprints and micro-scratches can hardly be prevented on this surface. 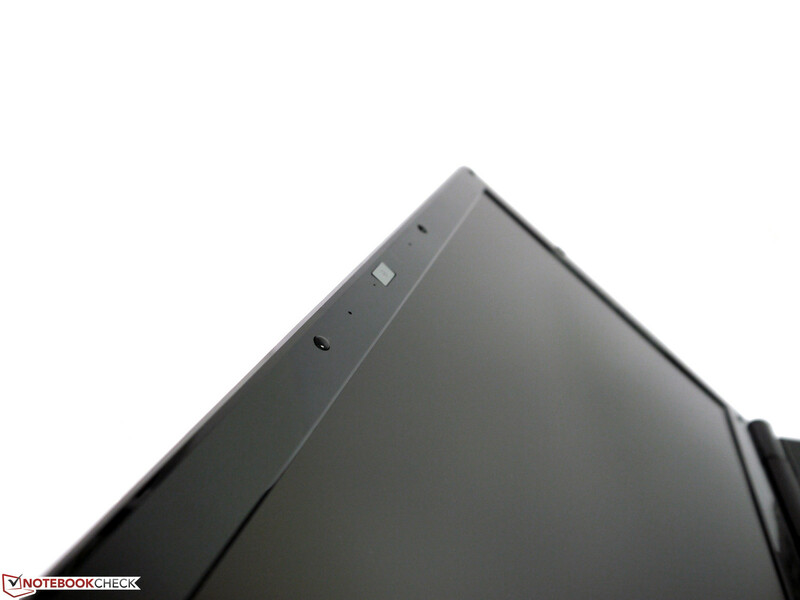 The display's hinge keeps the screen firmly in position and would even do a decent job on the move. Except for the unusual Thunderbolt interface, the XIRIOS W712 sports almost all up-to-date ports. USB 2.0, USB 3.0, eSATA, FireWire 800, DisplayPort, HDMI and DVI-I (integrated, VGA-compatible with adapter, not tested) cover a vast range. 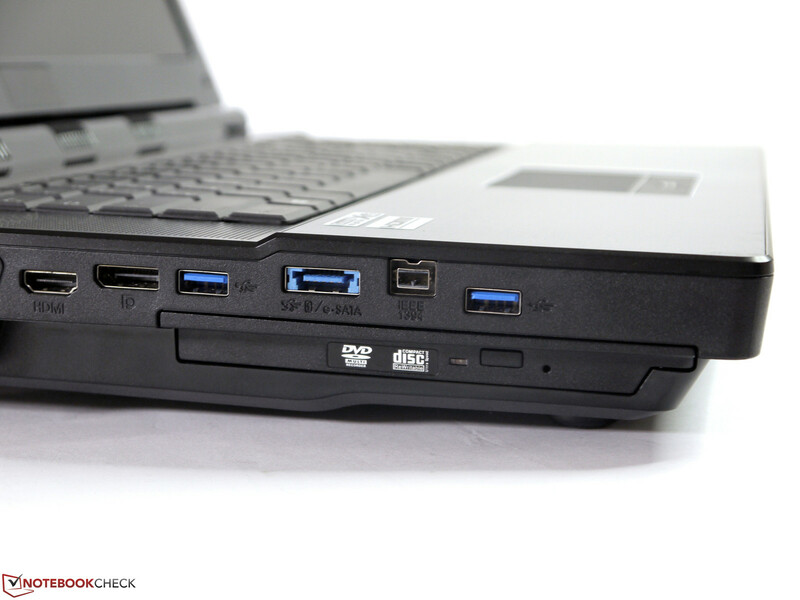 However, additional ports can be added via ExpressCard should that not suffice. The card reader's compatibility is also pleasing. While many current models usually only support SD cards, the XIRIOS also still supports multimedia cards and memory sticks in various formats. We did not find the interface positioning quite as good. All fast ports are on far left front. This may not be as distracting for right-handed users as for left-handed users, but it can interfere when working with connected peripherals. 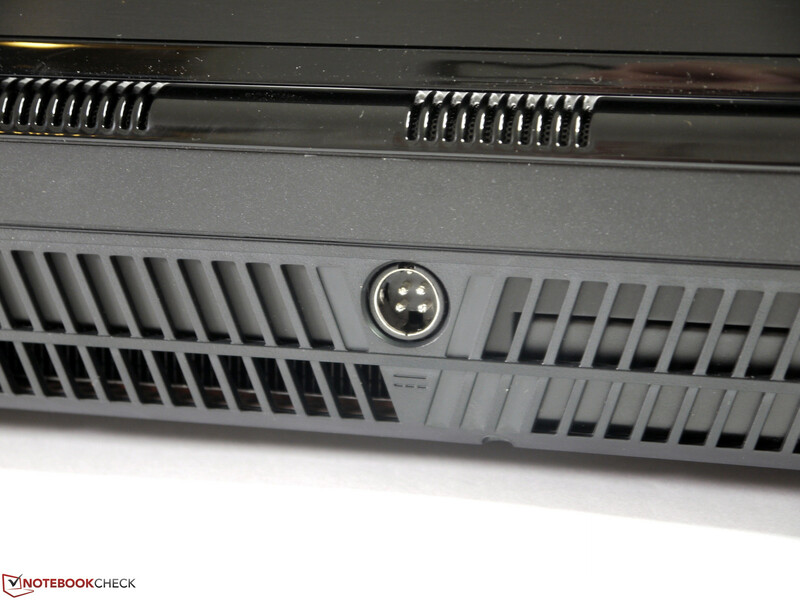 The ExpressCard slot's placement on the front is very adverse. It can only be used inconveniently because the card and external devices will inevitably be between the user and the laptop. 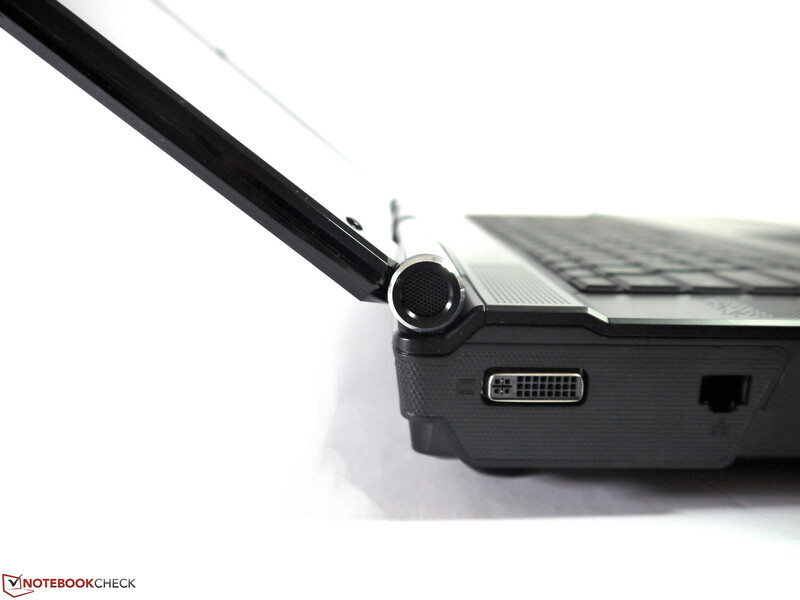 Like in most barebone laptops, there is no real docking port. 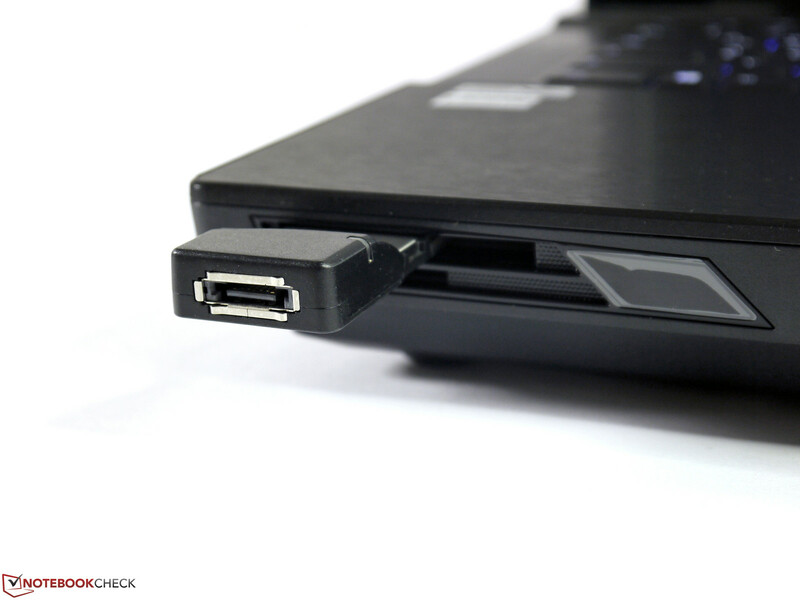 In case this feature is needed, a USB 3.0 solution would have to be used. Intel's Centrino Wireless-N 2230 is installed as the Wi-Fi module. It has two antennas, can theoretically achieve up to 300 Mbit/s and transmits in the 2.4 GHz band. More powerful wireless modules are optionally available for a surcharge. 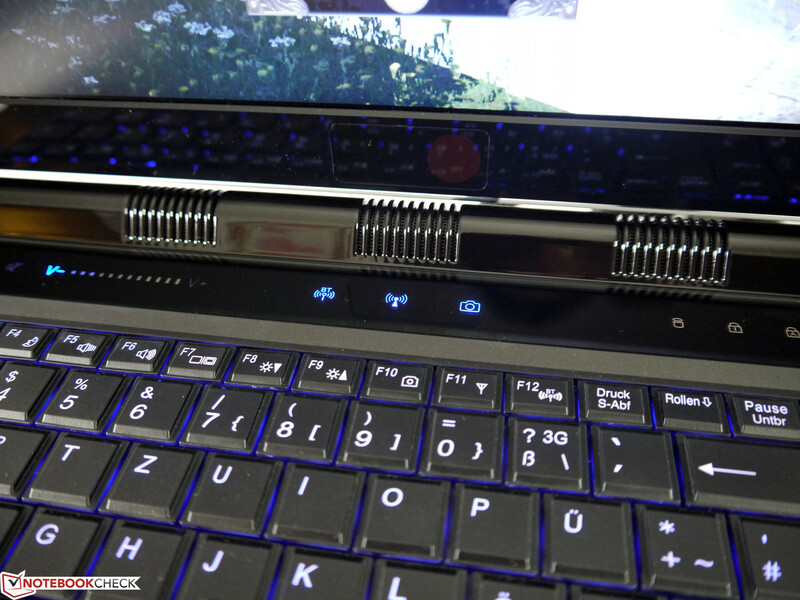 Other connectivity features include Gigabit LAN, a 3 MP webcam and Bluetooth 4.0. It is not possible to integrate a WWAN card. Besides various password options on BIOS and system level, the XIRIOS W712 features a fingerprint reader and a Trusted Platform 1.2 module. A Smartcard reader is not installed. Almost all components can be found underneath the large base cover that is fastened with five screws. 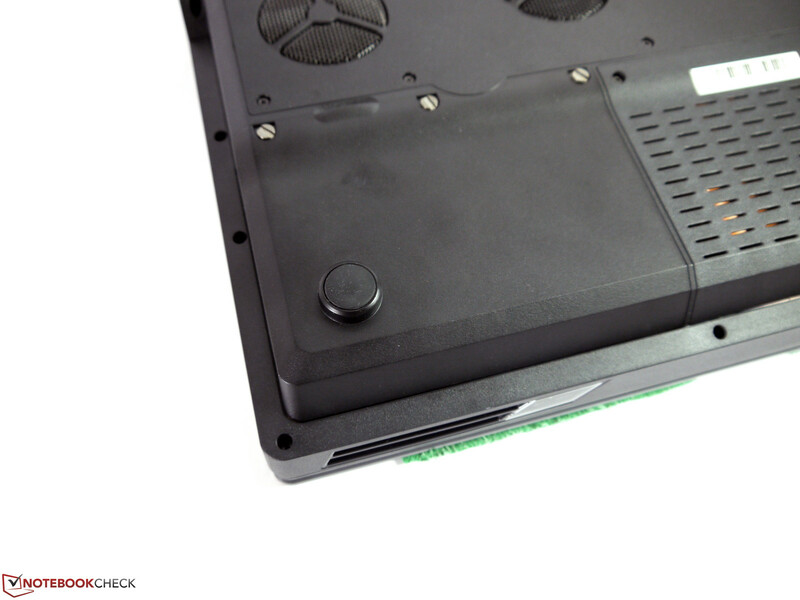 One hard drive is located underneath the battery and two other drives are stacked beside that in a slot. Two of the four RAM modules are underneath the keyboard and consequently not as easy to access. 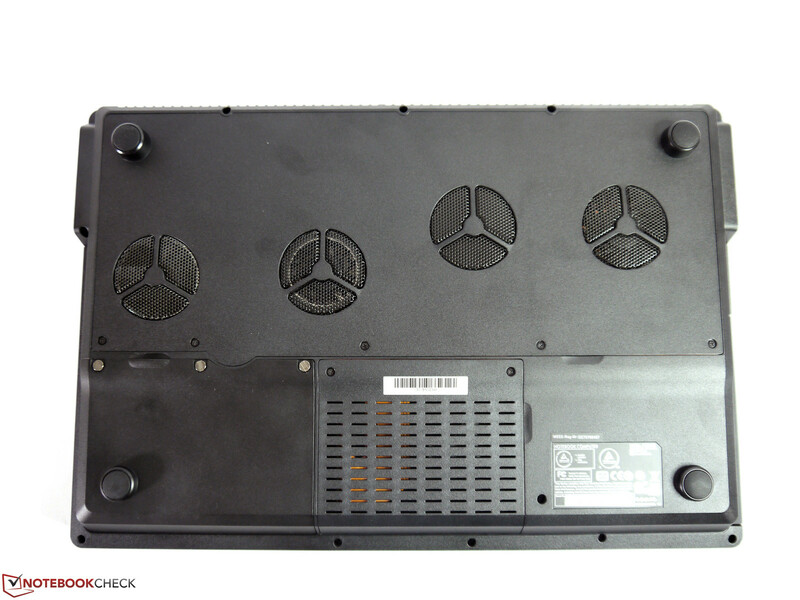 The fans of the performance components are freely accessible and can be cleaned easily when required. The manual does not mention any components that the user can replace by himself with the exception of the CPU. In cases of doubt, the manufacturer should be contacted before replacing anything. 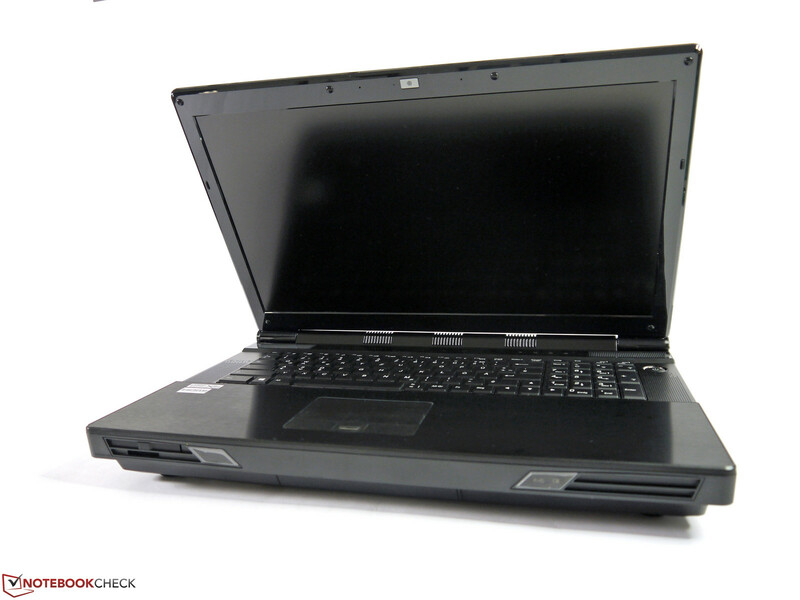 Schenker includes a standard warranty of 24 months pick-up & return + 6 months immediate repair on its XIRIOS W712. Optionally, a Premium Warranty of 36 months (pick-up & return) + 12 months immediate repair is available for 200 Euros (~$259) and a Platinum Warranty of 48 months (pick-up & return) + 24 months immediate repair for 400 Euros (~$518). 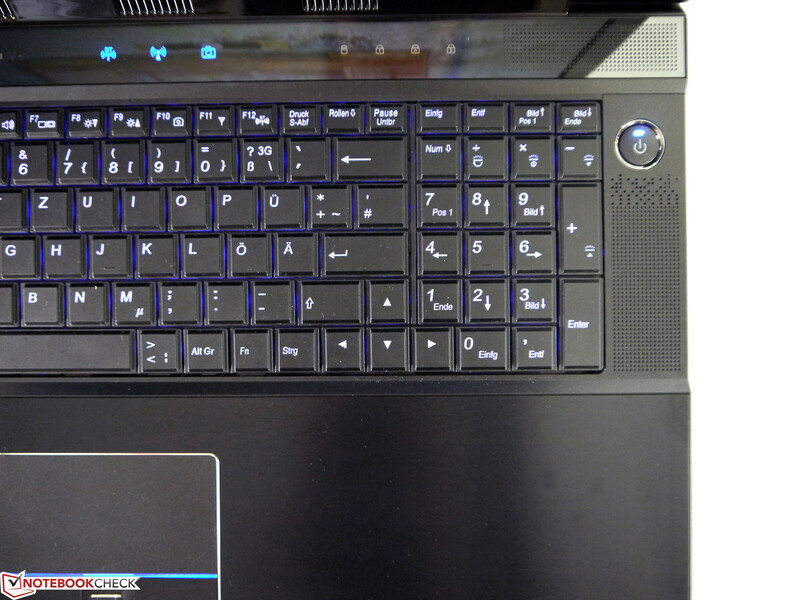 The keyboard alongside a dedicated number pad features 98 keys. Almost all are arranged in a 19 mm (~0.75 inches) grid. The keyboard mat lies firmly over the entire width and does not yield. The keys feature a medium drop, decent pressure point and a quiet stroke. The return key is a bit small and the omitted left FN key needs a bit of getting used to. The FN combinations are not colored and the icons are not always self-explanatory. However, the user will manage quite well after a short familiarization period. 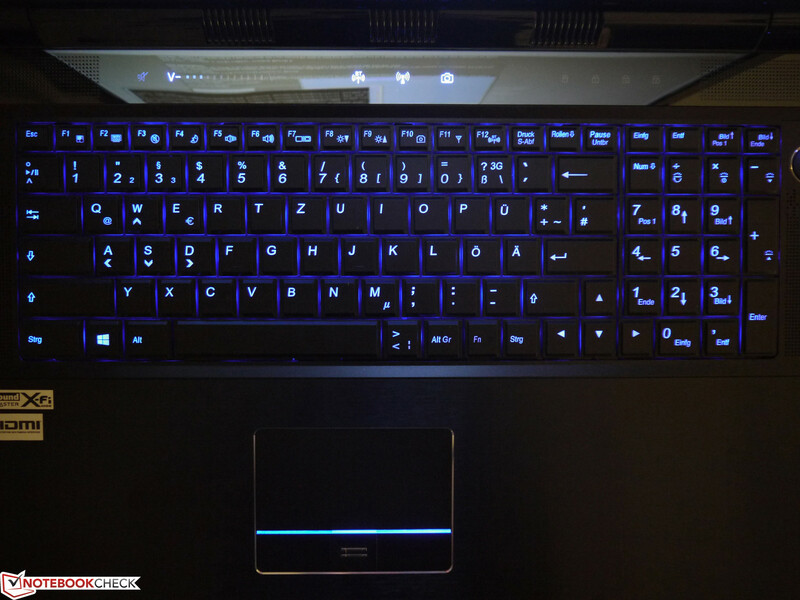 The backlit keyboard is divided into three zones and can be adapted to suit personal preferences with eight different colors. It is also possible to select predefined color effects with changing colors and different speeds. The modes dubbed Dancing, Random or Wave already indicate what is to be expected. It is possible to switch to an ordinary white backlight should this "disco-feel" be unwanted. 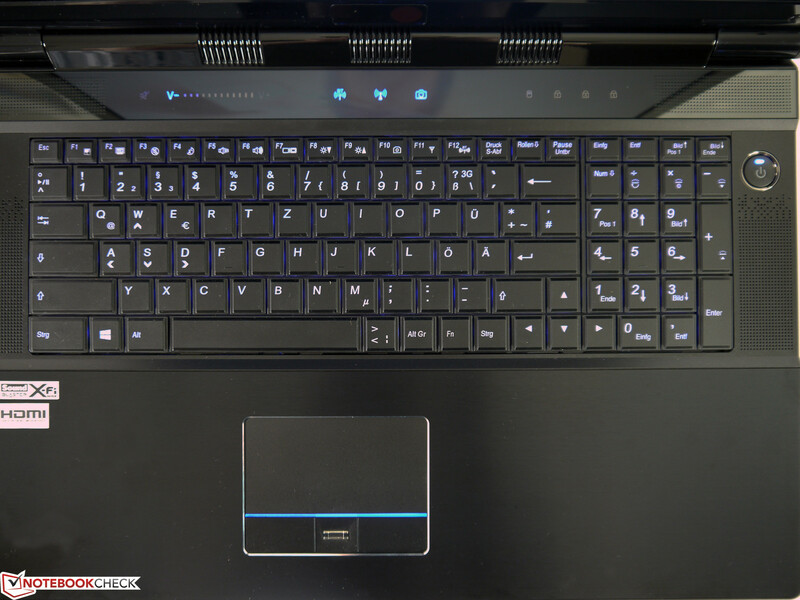 The XIRIOS features an overall very good keyboard that will even appeal to prolific typists. However, whether or not every gimmick is indispensable depends on personal needs. The touchpad measures 90 x 48 millimeters (~3.5 x 1.9 inches) and features good gliding traits. Finger taps are implemented a bit slowly and multi-finger gestures only respond sluggishly due to the rather small input area. 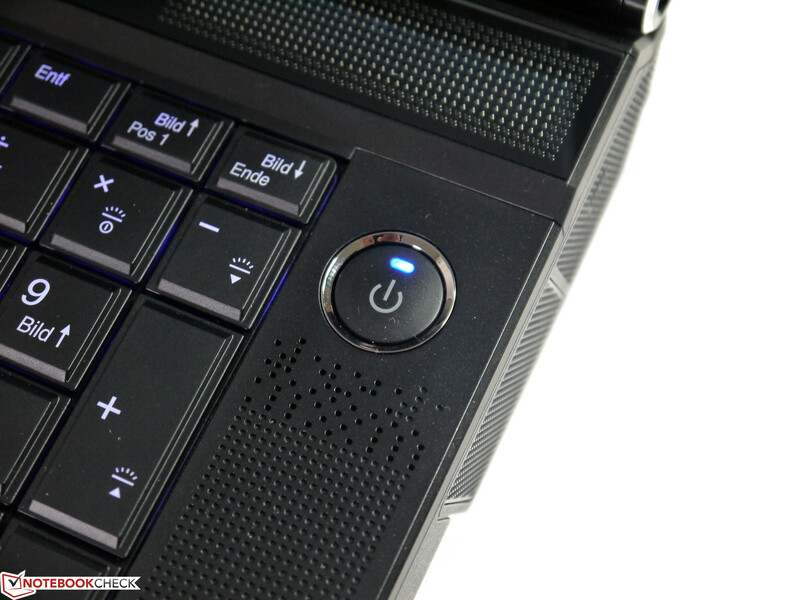 The touchpad's dedicated keys have a very short drop and work very reliably. However, the stop noise is quite loud. Schenker offers two different Full HD screens for the XIRIOS W712. The glossy option allegedly offers a color space (gamut) of 90%. 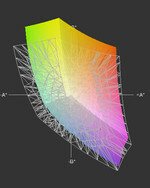 Looking at the review of Schenker XMG U702, this probably relates to the Adobe RGB color space. The other rates of the desktop replacement were just as compelling with an average brightness of 227 cd/m2 and a contrast of 595:1. Unfortunately, the surface is extremely reflective, which has a very limiting effect on some application fields. We had the matte alternative in our test model. It did not include any specs about color gamut or other qualities. XIRIOS W712 FHD matte vs. sRGB(t). 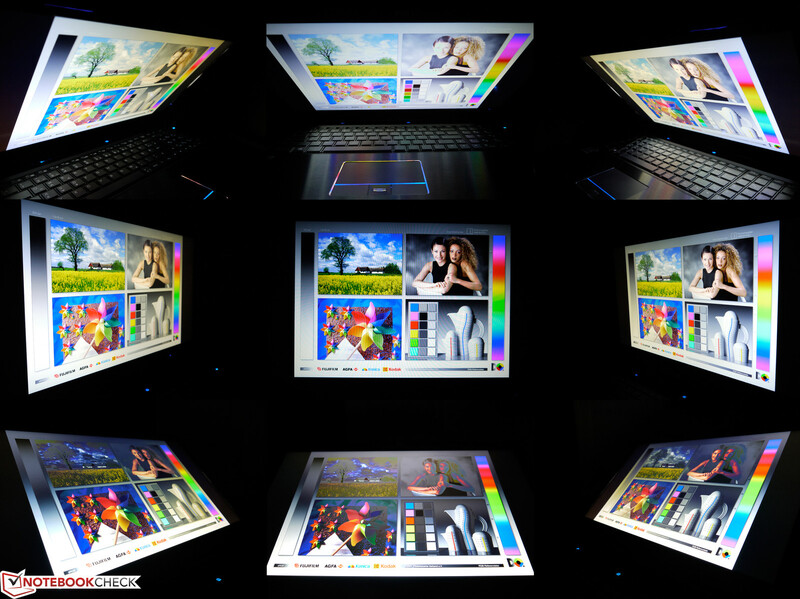 The screen comes from LG Philips and already convinces in the brightness assessment. With rates of 368 cd/m² in the lower right up to 421 cd/m² in the upper center, the test model's brightness is very high. 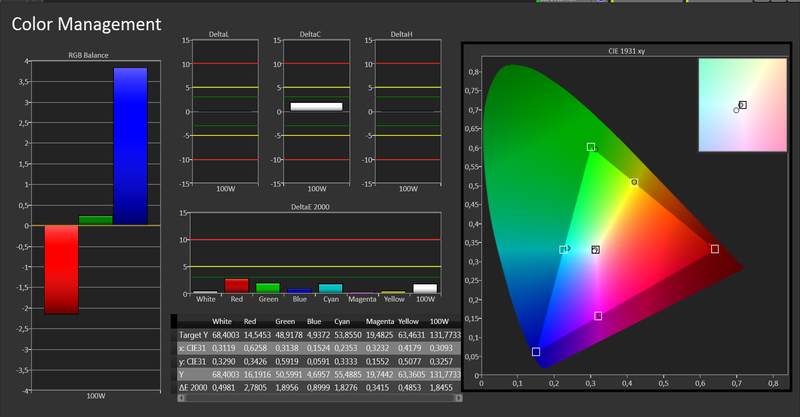 We calculated an average of 394 cd/m² and the illumination reached decent 87%. The eight available brightness levels only allow a coarse adjustment up to level 3 (206 cd/m²). Level 1 provides 44 cd/m² and level 2 equals 110 cd/m². The screen does not offer a range around 150 cd/m², which is usually well-suited to indoor use. The matte surface and the high maximum brightness ensure consistently good legibility outdoors. Relaxed work is even possible on bright summer days. The maximum brightness is also available in battery mode. The only shortcoming is the short battery runtime, which enormously restricts outdoor use without an outlet. We ascertained a contrast of 523:1, which supplies much richer colors and deeper black than the still often used standard screens. Pictures, movies and games look very attractive and the looks are only excelled on higher quality IPS or RGB LED screens. The sum of reproducible colors comes very close to the sRGB color spectrum. Unusual for white LED screens, it lacks coverage in the cyan-blue range. 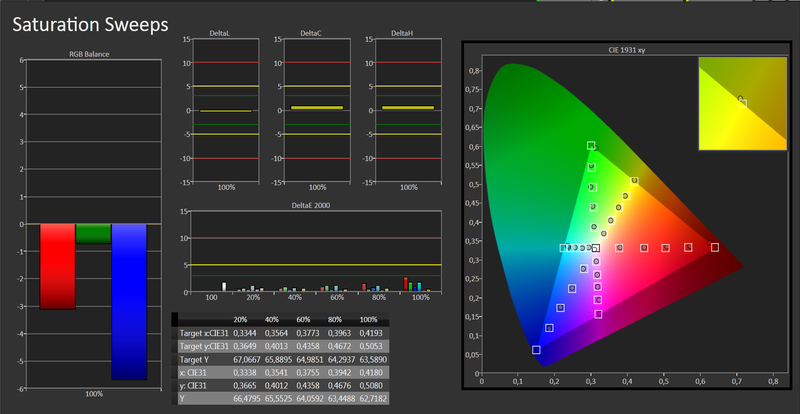 However, green, yellow and orange clearly exceed the sRGB color space target. Approximately 80% basically remain when only considering the intersection. Other qualities, such as color accuracy and saturation, are only moderate in state of delivery. The screen's true potential first develops after calibration. 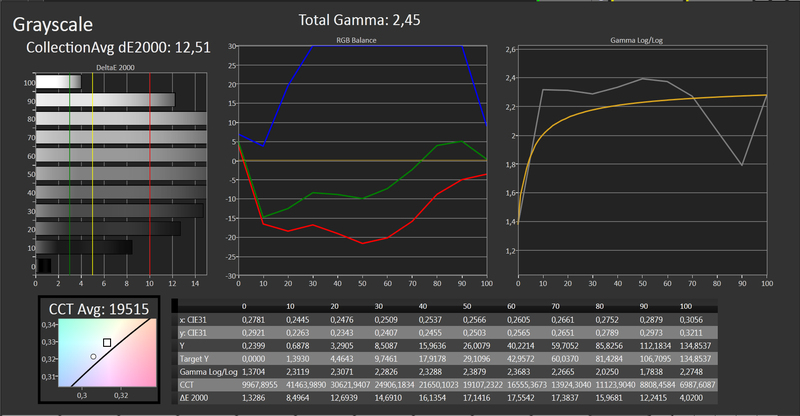 The DeltaE 2000 rates in the grayscale are very low with an average of 1.72. Deviating rates between 3 and 5 are visible to the human eye. 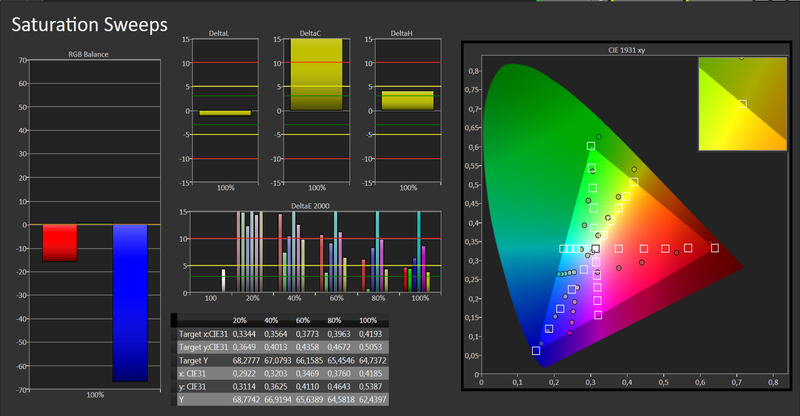 The color accuracy is also outstanding with consistent rates of a DeltaE 2000 below 3. The minor differences are not visible to the naked eye. The color saturation is also very close to ideal. All rates are within the target range and do not give reasons for criticism. The viewing angle stability is not as good. Although wide viewing angles for a TN screen are achieved, it does not come close to the very wide viewing angles of an IPS screen. A light green cast from the sides and brightness changes from a vertical view have to be accepted. The latter causes the content to fade or invert from extreme angles. Nevertheless, the objects always remain identifiable. The overall very good results ensure that the screen can be used very well in the professional field. The high brightness, good contrast, very good illumination and extremely accurate color reproduction, measured using a colorimeter, will appeal to image editors despite the imperfect sRGB color gamut. The not quite perfect viewing angle stability, the course brightness levels and the incomplete color space coverage are a bit restrictive. 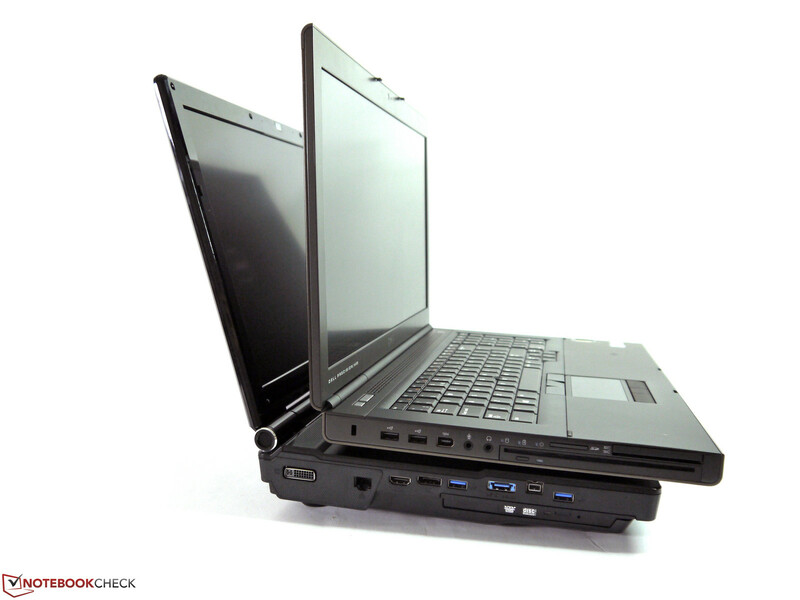 Schenker's XIRIOS W712 workstation can only be configured with desktop CPUs and high-performance graphics chips. The generously designed power supply unit with a nominal power of 330 Watts indicates that energy saving is not an aim. It is even possible to install a dual-graphics system from AMD or Nvidia, up to three 2.5-inch storage devices and a maximum of 32 GB of RAM. 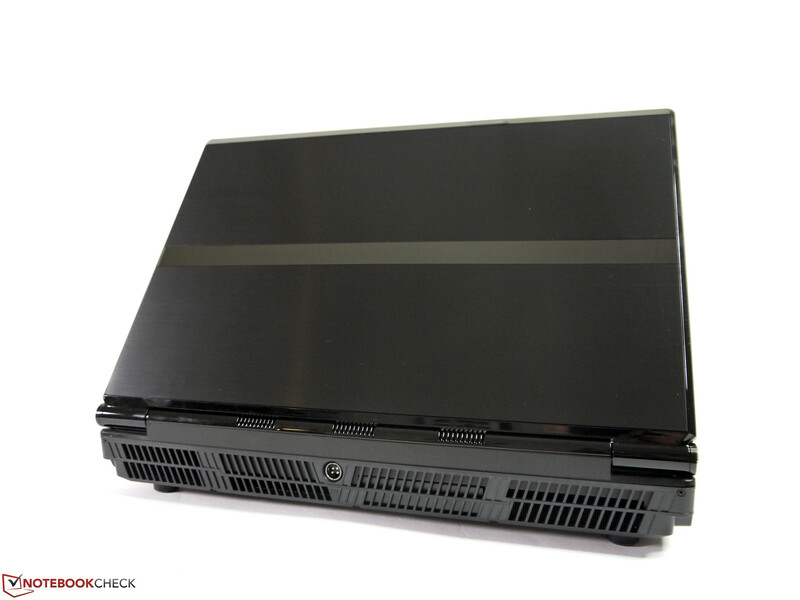 Our test model is configured for use as a professional workstation and sports Intel's Xeon E5-2680 CPU, Nvidia's Quadro K5000M graphics, 32 GB RAM, a 256 GB SSD and two hard drives with a storage capacity of 1000 GB each. 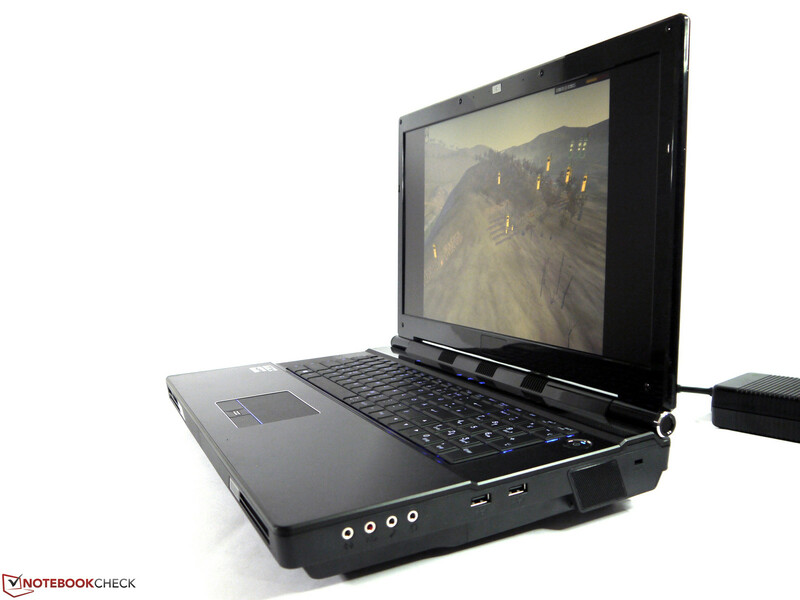 The laptop currently costs around 5900 Euros (~$7646). Intel's Xeon E5-2680 desktop processor has eight cores and can process up to 16 threads at the same time using the Hyperhreading technology. The clock increases up to 3500 MHz in single-thread tasks and thus ensures a better CPU capacity. 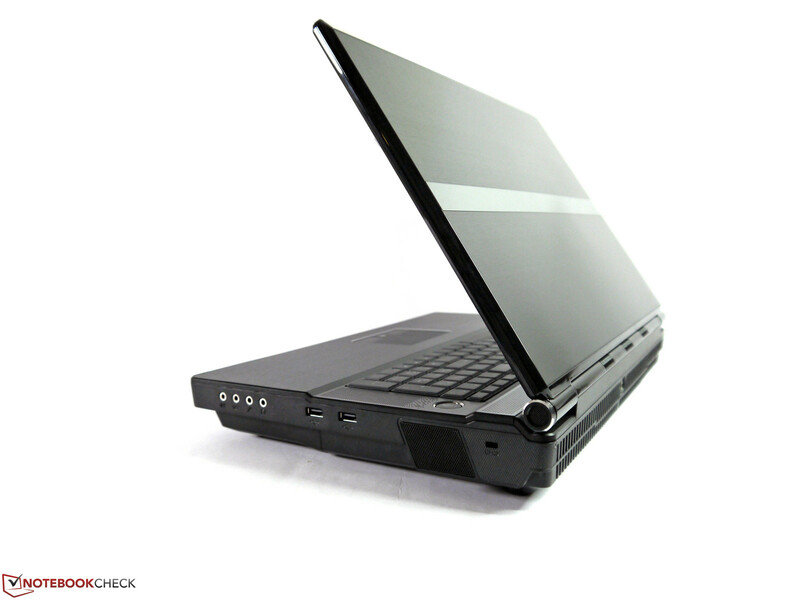 This theoretical, high performance is achieved with an enormously high thermal design power of 130 Watts for laptop conditions. According to Schenker's spec list, our CPU does not feature Turbo Boost contrasting the actual possibilities. The clock is allegedly limited to 2.7 GHz and thus waives on a not insignificant share of performance. In fact, the tools we used displayed clock rates of up to 3.1 GHz. That is exactly between the default clock of 2.7 GHz and the maximum of 3.5 GHz. This ultimately corresponds to a limited, but not completely omitted Turbo Boost. The impact of this restriction is seen in the single-thread tests that would directly benefit from a high Turbo Boost. The scores in Cinebench R10 (32-bit, single-thread) of 4100 points and in SuperPi 32m of 12 seconds, for example, clearly lag behind Intel's Core i7 3820QM CPU (3800 MHz). 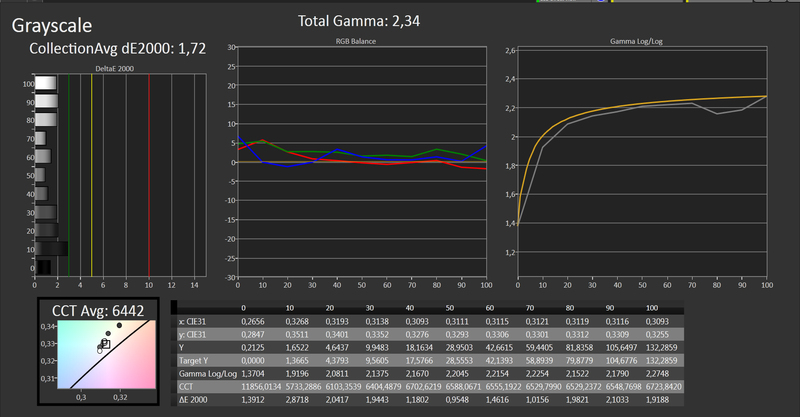 It achieves over 5100 points and finishes the SuperPi calculation in only 9.4 seconds. We converted MP3 files to AAC format using iTunes in the practical test. 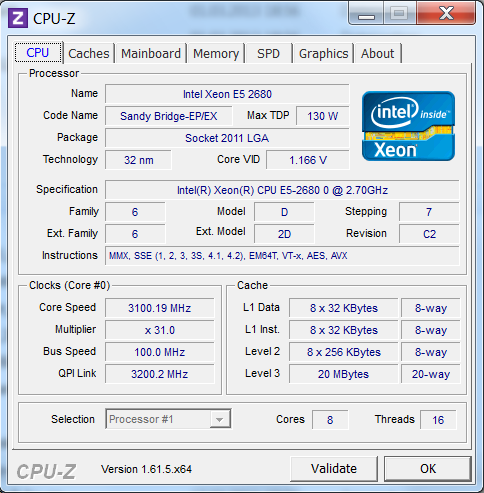 The Xeon CPU achieved an x38.7 speed and thus places itself between two mobile Core i5 CPUs. 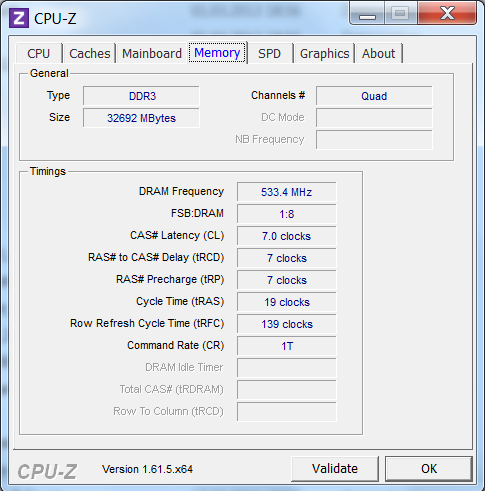 The clock difference of 700 MHz consequently shows its effect in single-thread tasks and results in a bitter defeat for the desktop behemoth compared with mobile alternatives with a high clock. The tide turns in operations that can distribute their workload over as many computing cores as possible. For example, 26801 points were achieved in Cinebench R10 32-bit multi-core and the wPrime 1024 calculation finished after 130 seconds. The currently fastest mobile CPU, Intel Core i7 3940XM, only achieves 20501 points and needs 220 seconds for the wPrime task. Thus, a performance gain of approximately 25% to 60% in favor of the desktop CPU is ascertained. 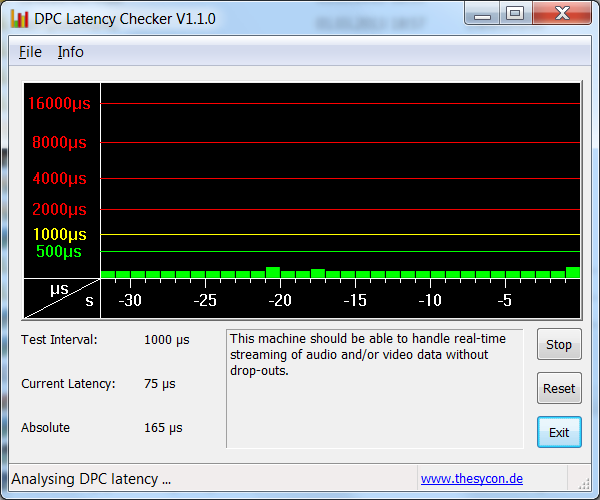 We converted two videos using Cyberlink's MediaEspresso with the Xeon E5-2680 CPU in the practical test. Here we observed that the 16 threads are not used for achieving the maximum performance, but rather for keeping the overall processor load at a minimum. 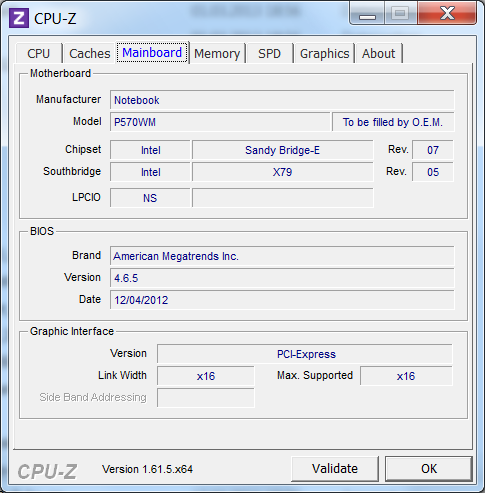 The low processor capacity of roughly 20% is completely unusual for converting using only the CPU. This task was always performed with far over 90% in our previous tests with mobile processors, which can also lead to a more or less big speed advantage depending on the video format. Whether the Xeon E5-2680 CPU is the right choice for personal requirements is decisively dependent on whether or not the used software can benefit from the 16 possible threads. 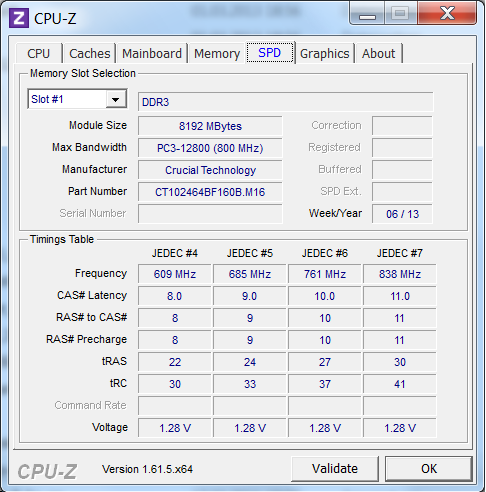 More comparison data can be found in our detailed CPU benchmark list. We could not induce a CPU or power supply throttling even after several hours of full load. 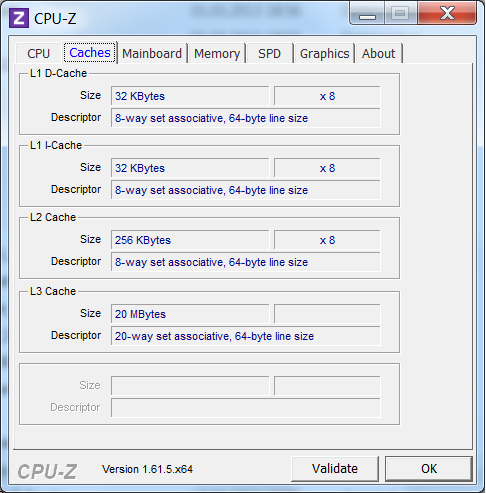 The CPU's performance remained continuously stable. We recorded a virtually identical result on battery power (11.94 points) as in AC mode (11.94 points) in Cinebench R11.5. The system performance is within the absolute high-end range. Owing to the swift solid state drive and generous working memory configuration, the potential system bottlenecks have been bypassed well. 19165 points were achieved in PCMark Vantage and PCMark 7 finished with a score of 4301 points. With this configuration, the user will not have to worry about not enough power for a while. There is barely any potential for optimization evident here. Only a swifter solid state drive, faster working memory or a higher clocked CPU could result in measurable but unlikely noticeable advantages. There is only a great performance increase in the graphics sector by using a dual-GPU system should a professional graphics card not be required. 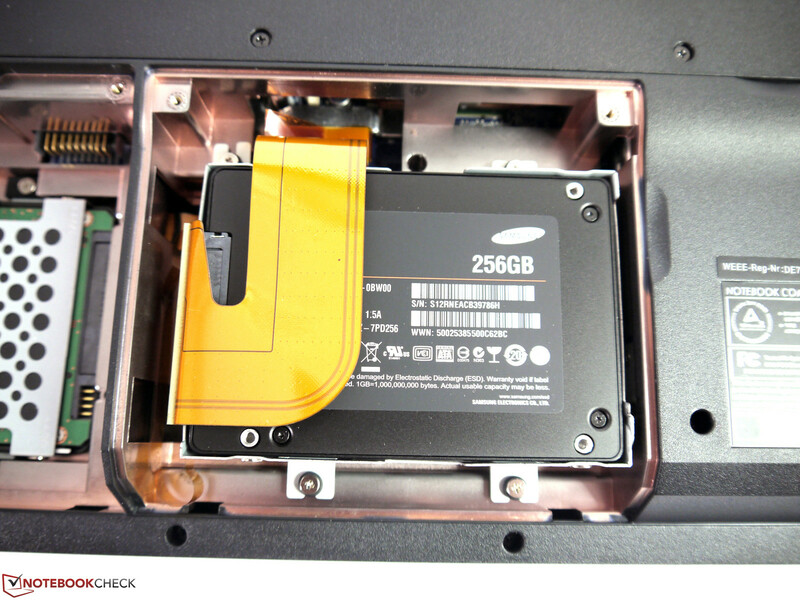 Our test model featured Samsung's 840 Pro SSD as the system drive. It convinced with a very high speed in all test fields. 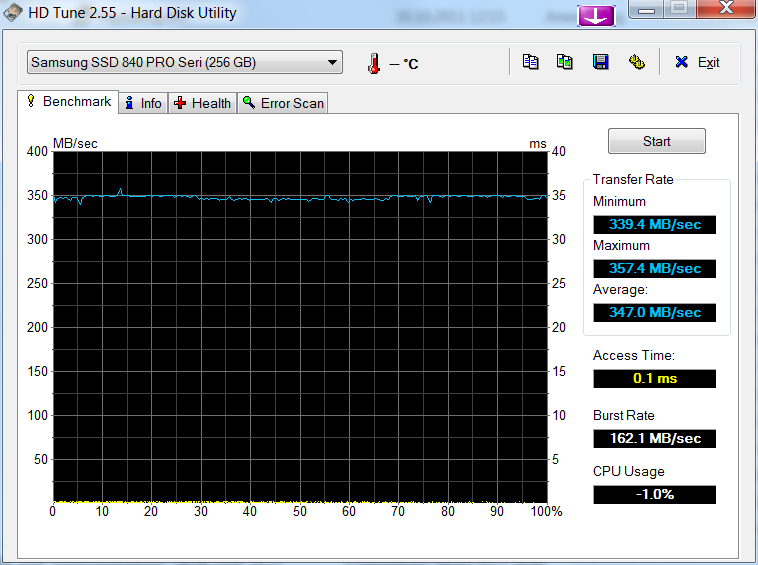 With a sequential read and write rate of over 500 MB/s, this drive doubtlessly belongs to the premium range. Beyond that, its capacity of 256 GB is absolutely sufficient for the operating system alongside innumerable programs. Two 1 terabyte hard drives from Seagate are available for storing large amounts of data. They rotate with up to 5400 rpm and achieve an average transfer rate of nearly 88 MB/s. The user can also choose among many various storage devices that can be customized to meet personal needs. 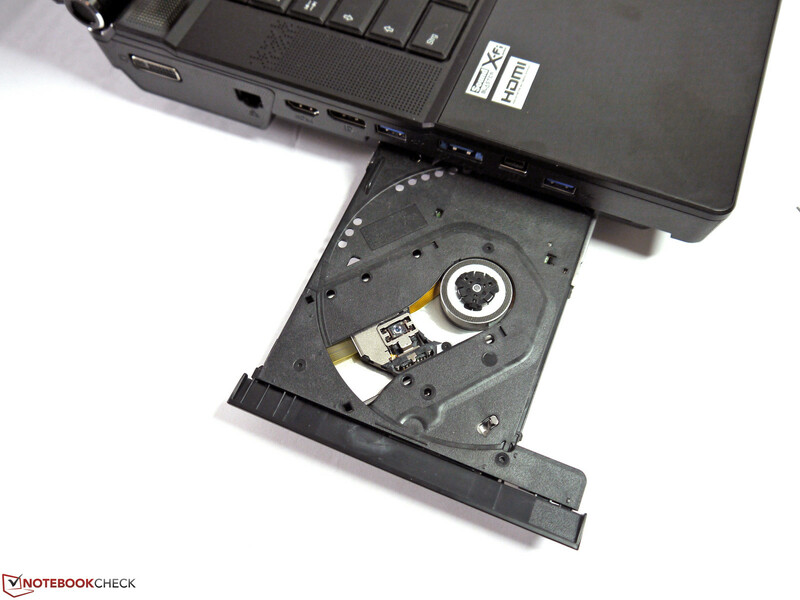 It is also possible to install a hard drive frame in the DVD drive slot and implement a fourth drive. The system supports RAID 0, 1 and 5. We did not find an mSATA slot. Nvidia's Quadro K5000M is the top model in its professional graphics card range. It features a 256-bit memory bus, has 4 GB of GDDR5 graphics memory and, in our test model, a maximum core clock of 601 MHz. Compared with consumer graphics chips from the GeForce range, the Quadro's performance ranges between the GTX 680M and GTX 675M. It is the special Quadro drivers that make the professional Nvidia Quadro K5000M to what it is. They ensure very high performance particularly in 3D construction programs. Depending on the program, even the most potent GeForce chips are surpassed by several hundred percent owing to the optimized drivers. 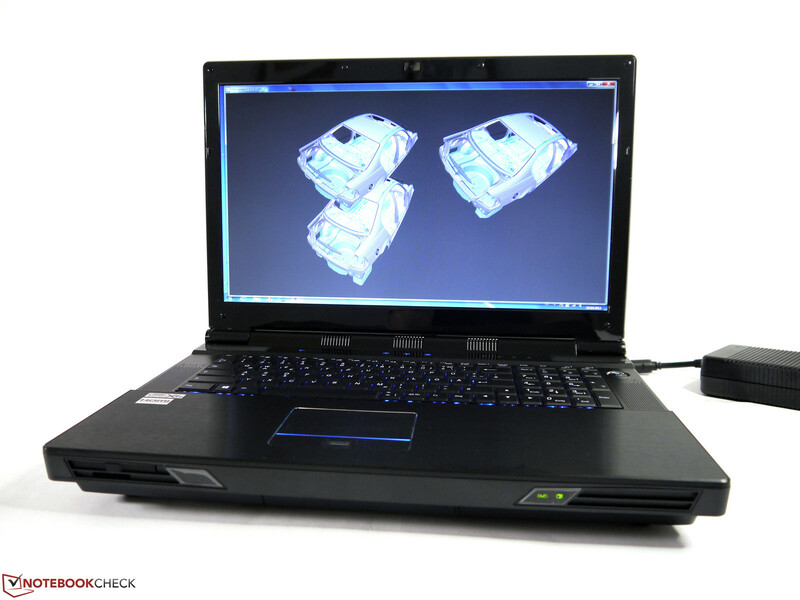 We used the SPECviewperf 11 benchmark, which processes a selection of CAD programs with different working models, to test this special ability. The top model could not stand out from the competition in all test series. It was defeated by the Quadro K3000M in Bullman's workstation in Lightwave and ProEngineer and AMD's FirePro M6000 even surpassed it in Solidworks. In return, its advantage was partly very clear in other areas and promises a quite impressive performance increase that could add up to approximately 100%. It is also obvious that the high-performance SLI array of two GTX 680Ms cannot compete in any way with the Quadro K5000M or another professional card. The differences are only not as big in Ensight. Potential buyers should therefore circumspectly inform themselves whether the used programs really benefit from the respective graphics. We ascertained the Raytracing capabilities with the Luxmark 2.0 benchmark, which performs extensive light-shadow calculations using the OpenCL interface. Like all other previously tested Nvidia GPUs, Nvidia's graphics achieved a relatively low score with 301 samples/s in the Sala test and 137 samples/s in the Room test. The stronger AMD GPUs are much better in this field. 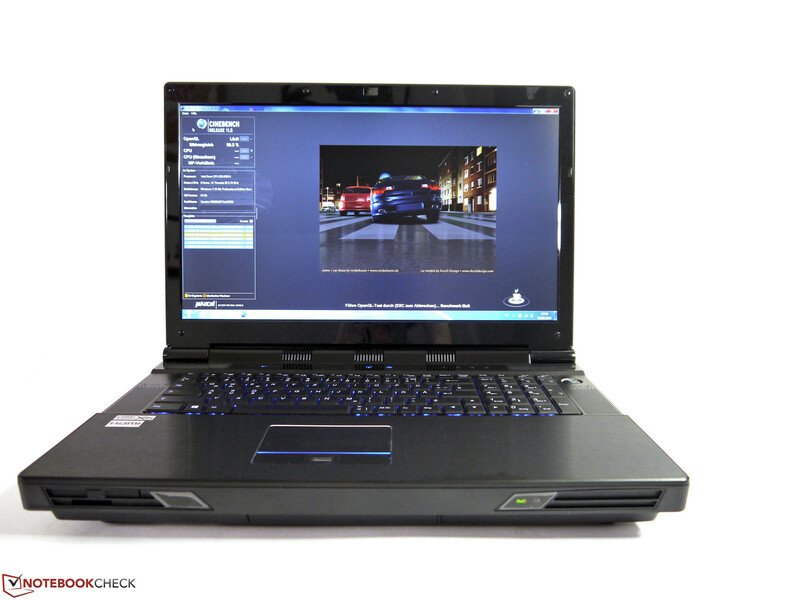 AMD's Radeon HD 7970M in Schenker's XMG P502, for example, reached 1218 samples/s and 698 samples/s. Nvidia's Quadro K5000M achieved the scores of comparable GeForce models in the usual consumer graphics benchmarks. It was 20460 points in 3DMark Vantage and 115180 points in 3DMark 11. 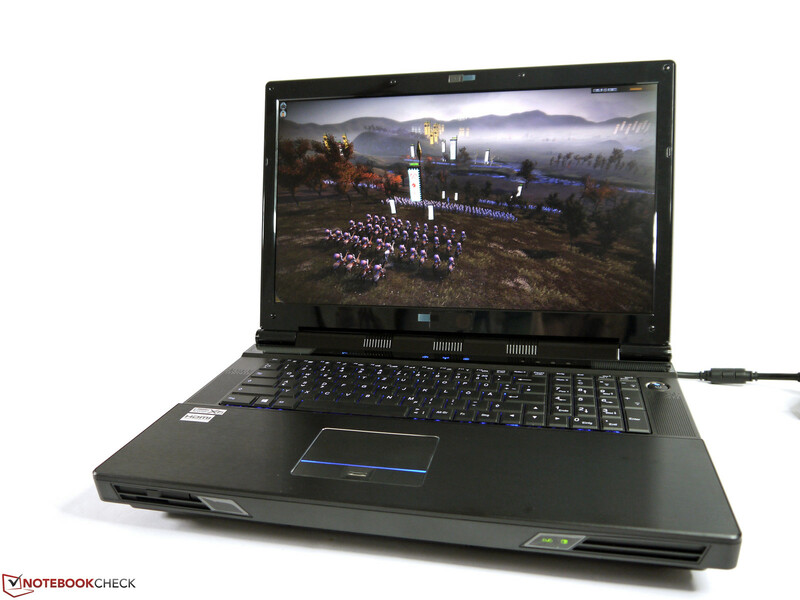 Thus, the performance is between Nvidia's GeForce GTX 675M and Nvidia's GeForce GTX 680M, as anticipated. Disadvantages due to the optimized Quadro driver are therefore not to be expected. In the OpenGL tests, like Cinebench R11.5 or Heaven 3.0 OpenGL, it achieved 76 fps and 43.5 fps. These results also correspond to the expected performance and are located in the high-end range. Video converting via CUDA and MediaEspresso did not exhibit a speed advantage compared with other Nvidia graphics engines. The results of various high-performance Quadro graphics cards are all very close. Consequently, it would be rather unnecessary to turn to this highest-performance version for this application field. The graphics unit is throttled on battery power and only achieves just below 40% of its actual performance. In contrast to 76 fps, only 30 fps were achieved in Cinebench R11.5 OpenGL Shading. In return, the clock did not throttle even after several hours of full load in AC mode. The tested games were rendered smoothly in our maximum settings. 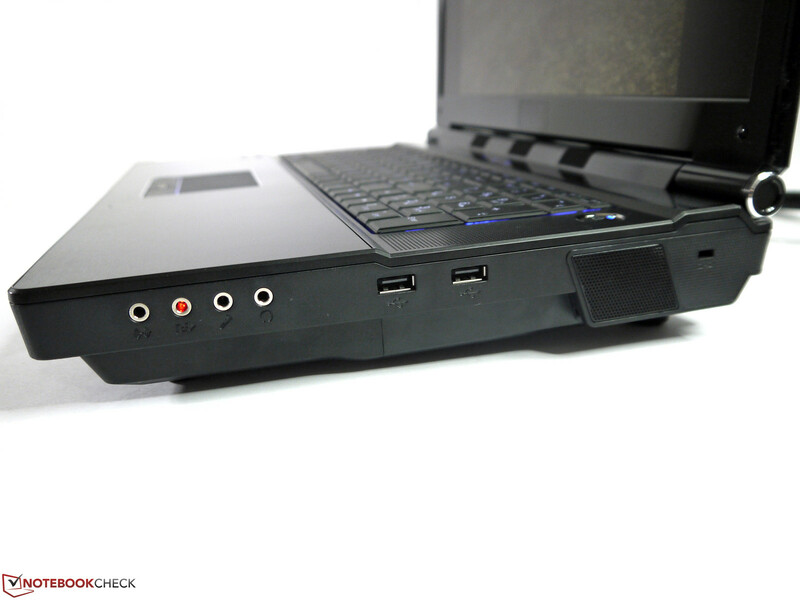 The laptop might find its limits only in very demanding tracks such as Metro 2033, Far Cry 3, Hitman: Absolution or Crysis 3 (none tested). Apart from the high weight, the XIRIOS W712 scored exceptionally well up to this rating sector. However, the noise development already indicates where the user has to accept another drawback in favor of high performance. A very audible operating noise is always present with a minimum level of 35.4 dB (A). It quickly increased to 36.8 dB (A) when smaller tasks are performed, which will be the order of the day even during normal office use. 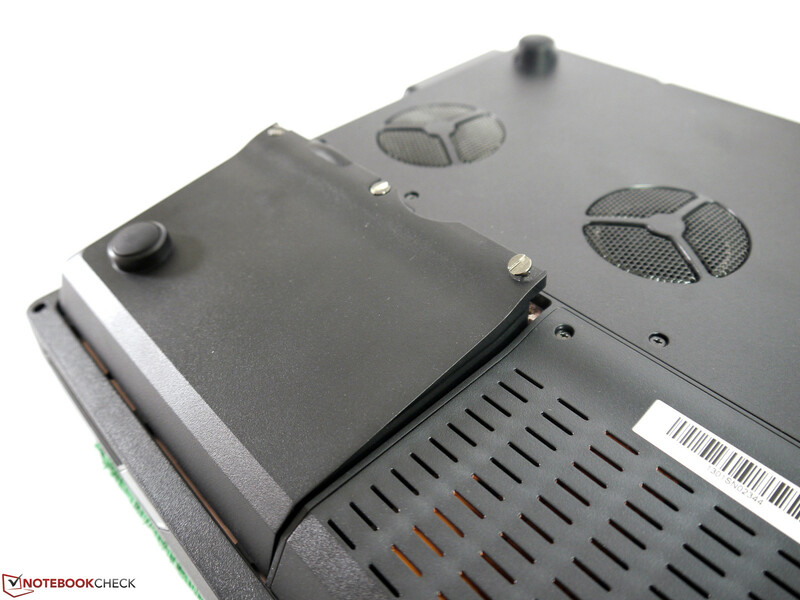 The fan's activity increases considerably as soon as the graphics unit or processor is put under higher load. Then the user has to tolerate a turbine-like cooling with a noise emission of over 47 dB (A), which gets very unpleasant in the long run. Therefore, it is recommendable to use headphones when playing a game and the user should seriously consider buying earplugs for work. The extremely persistent fan activity ensures a very cool casing and components. The working memory, processor and graphics card are cooled separately. According to GPU-Z, the graphics card did not exceed 40 °C (104 °F) even after 2 hours of full load. The casing's surface did not surpass 40 °C after this load period either, which ensures very agreeable casing temperatures. It was even only a maximum of 30.4 °C (86.72 °F) during little load. This is very good for a workstation. We did not notice temperature throttling and the performance output remained stable even after over two hours of full load. (+) The maximum temperature on the upper side is 39.5 °C / 103 F, compared to the average of 37.1 °C / 99 F, ranging from 23 to 69.8 °C for the class Workstation. (-) The average temperature of the palmrest area of similar devices was 27.8 °C / 82 F (-2.8 °C / -5.1 F). The sound quality of the XIRIOS speakers is much better than in most business laptops and shows that the Clevo barebone was actually made for another purpose. A dedicated 2 Watt subwoofer supplies pleasant bass. The sound is quite balanced, although it is a bit treble-heavy. It does not distort in high volumes. The maximum volume is however rather low and will likely find some criticism in the gaming faction. However, it is acceptable for a workstation and enough for presentations in a small group or to drown out the fan during games. 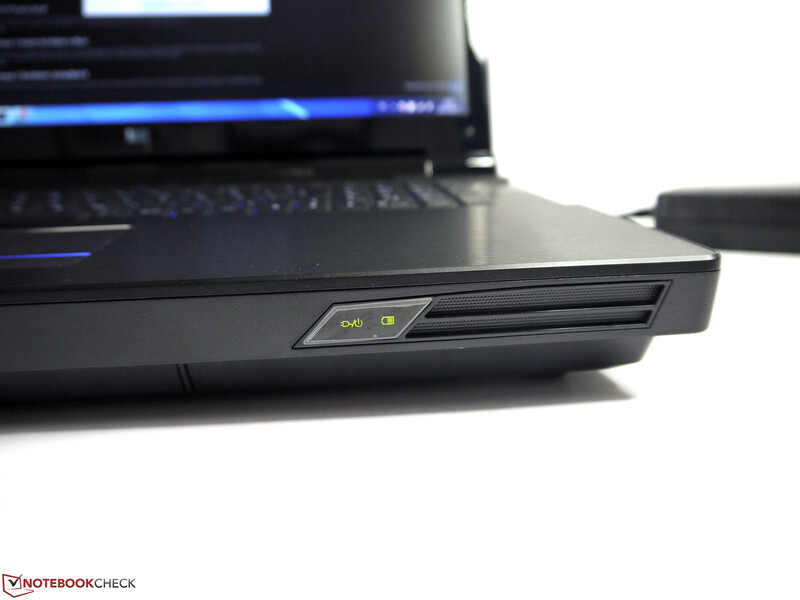 The internal system cannot compete with the quality of Asus' N76VM/VZ that features an external subwoofer. 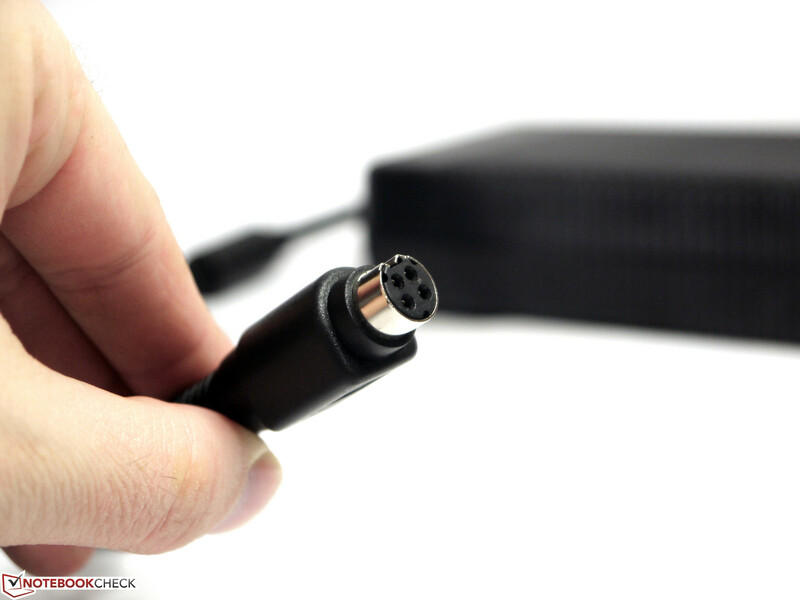 External audio-digital multi-channel sound systems can be connected via S/PDIF. Up to 8 channels (7.1 system) are possible. 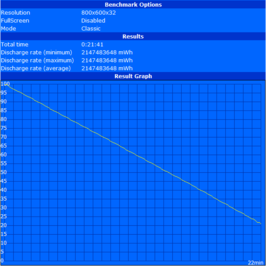 The power consumption of the XIRIOS W712 is completely out of the question. 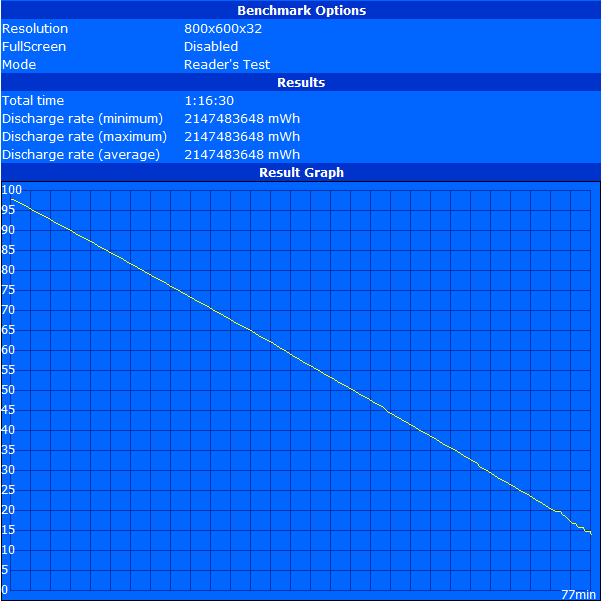 With 57.2 Watts at idle, more power is consumed than some laptops need during full load. A not exactly low performance Dell Precision M6700 manages with just 19 Watts. The enormous power consumption of the desktop CPU and Quadro K5000M graphics increase that even more during full load. A maximum of 267 Watts is possible. The power supply with a nominal power of 330 Watts at least still has enough reserves to cater to the high power consumption without problems. The battery's capacity of 78 Wh is ridiculous in view of the power hunger and could only provide a maximum runtime of 1 hour and 17 minutes even during the lowest load (Battery Eater Reader's test, minimum screen brightness, Wi-Fi off, energy-savings profile). At most one hour of Wi-Fi surfing with a brightness of slightly over 100 cd/m² and using energy-saving mode was possible (the next brightness level would already be over 200 cd/m²). The laptop shut down after just 22 minutes during full load. The battery however still had a rest capacity of between 10% and 21% instead of the set 3% in all tests. But that would not really improve matters either. 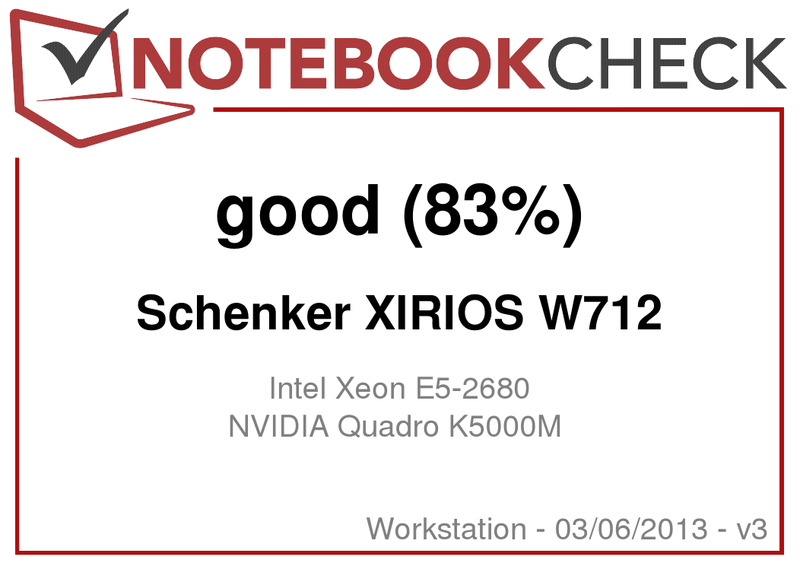 Schenker's XIRIOS W712 workstation is an extremely powerful laptop. The processor and graphics performance range on a high-end level and can currently only be surpassed in a few areas by alternative configurations. Beyond that, the performance output is always stable even during long periods of full load and does not throttle. The user only has to count with a noticeably reduced graphics performance on battery power. The basic equipment and the configuration options are very good and provide the user with many individually determinable features. It is not a matter of course that most components are accessible and thus easy to maintain and will likely appeal to many potential buyers. The matte Full HD screen pleased with overall very good qualities in the test. However, it does not feature the wide viewing angles of an IPS screen and does not completely cover the sRGB color spectrum. In return, this workstation does not sport typical business features, such as an integrated Smartcard reader or a real docking port. In principle, the high weight can be tolerated in a workstation that is mostly stationary. The extremely high power consumption and the resulting miserable battery runtime could be more restrictive in some situations. 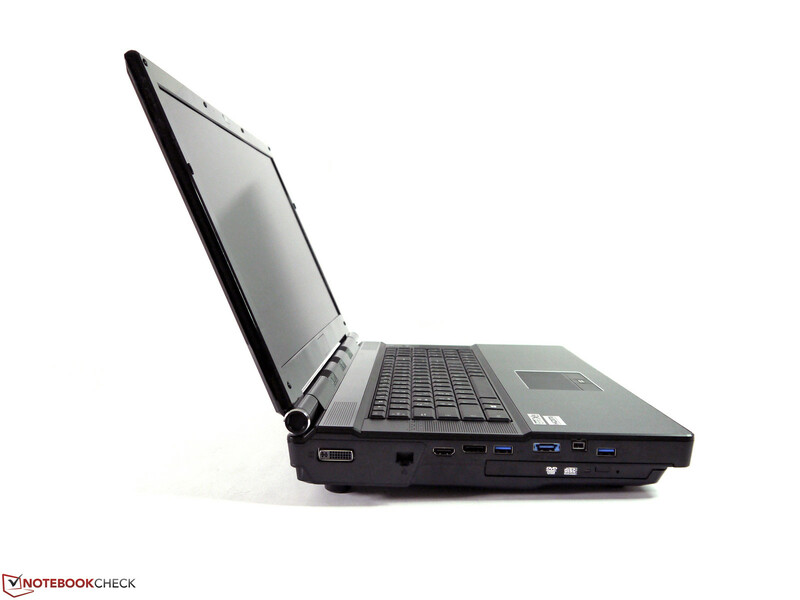 The XIRIOS W712 can only be used for an hour without its power supply. However, the biggest criticism and the biggest restriction is the comparatively high noise development in all load scenarios. The competition completely based on components made for mobile devices do an audibly better job. Users who can accept these restrictions will get a high-performance workstation with many good and very good qualities. It is also quite attractively priced compared with similar contenders. 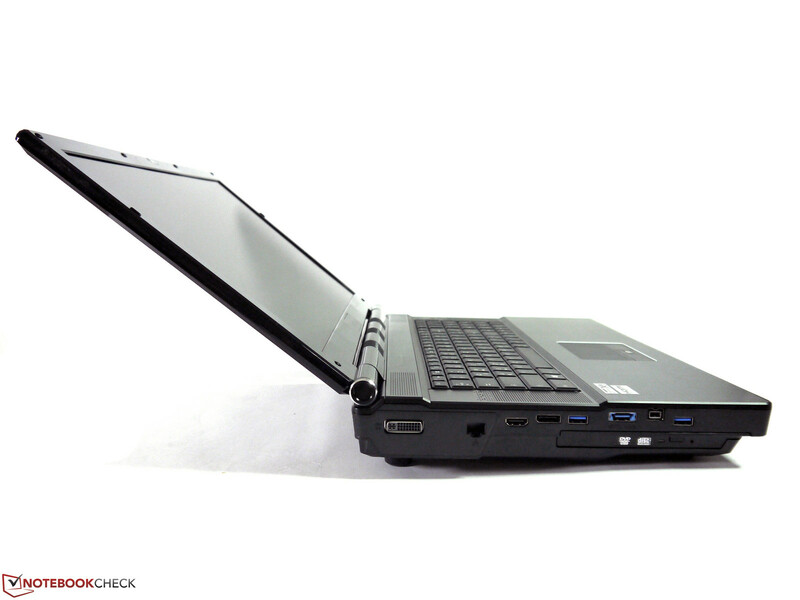 The XIRIOS W712 is a superlative laptop. The optical drive gets quite loud with roughly 38 dB (A). 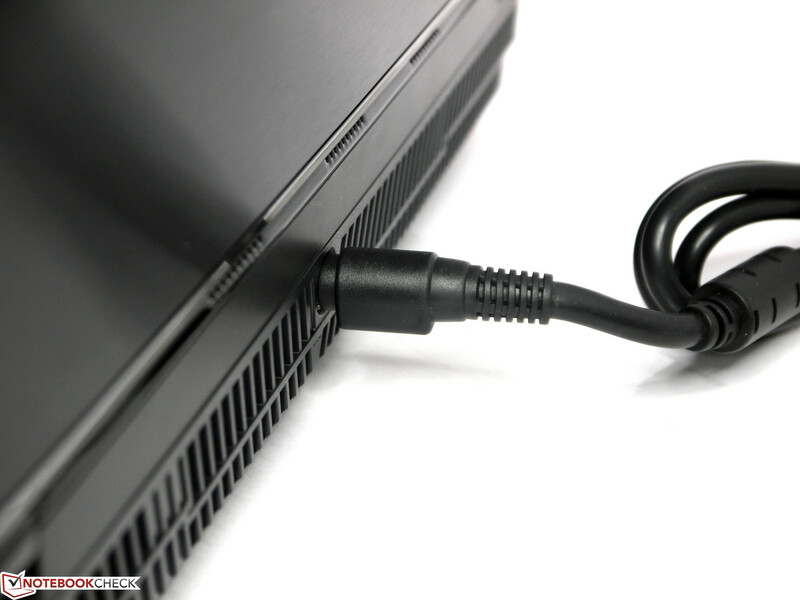 Analog monitors can be connected to the DVI-I port via a DVI-VGA adapter. USB 3.0, eSATA and FireWire 800 cover all conceivable interfaces. It only lacks Thunderbolt. The power supply has an enormous nominal power of 330 Watts. Only about 1 hour of use is possible without the power supply. It is caused by the components' high power consumption and the resulting cooling activity. A big disadvantage of the XIRIOS W712 is the high noise development. 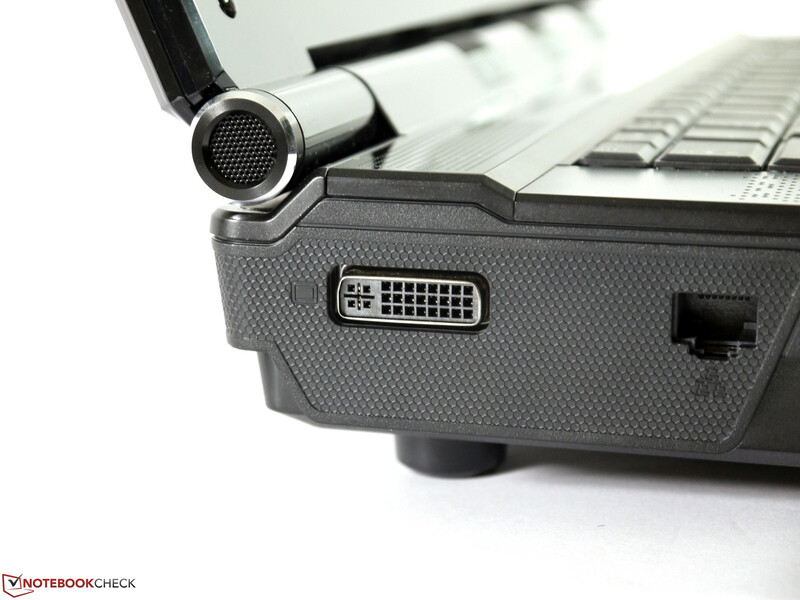 The distance between the USB 2.0 ports are generous and also enable using bigger USB extensions simultaneously. 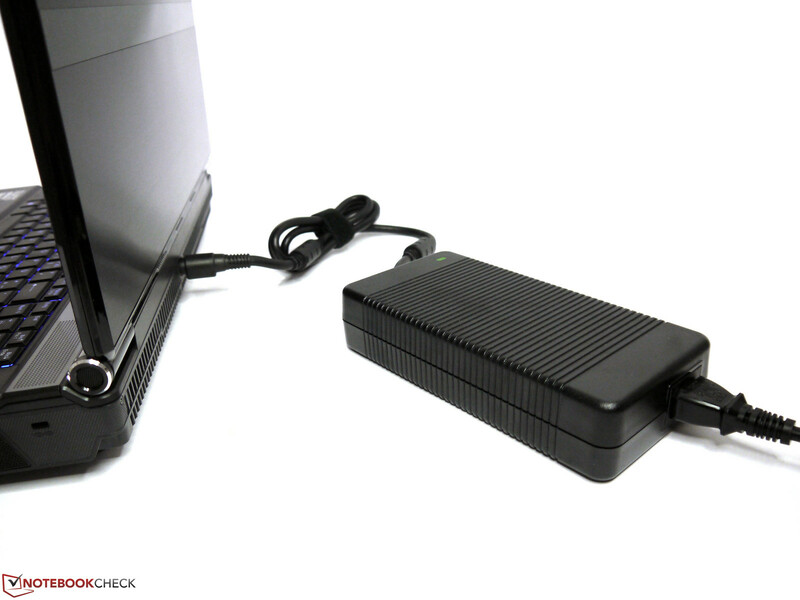 Devices with a dual-graphics run with two power supply via adapter. Then all four vents are occupied. Left: The XIRIOS' PSU. Right: The Precision's PSU. 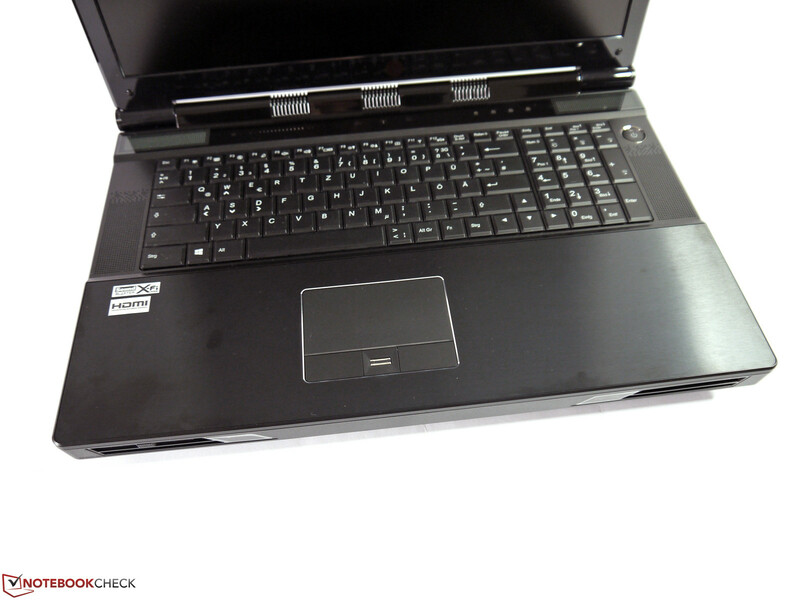 The XIRIOS W712 cannot compete with Dell's Precision M6700 regarding mobility and noise emissions. According to the manual, the user mustn't replace the CPU. Two more storage devices can be stacked beside that. there is still enough room for a 2.5-inch drive. The battery is fastened with three screws and is necessary in stationary use for a secure placement. 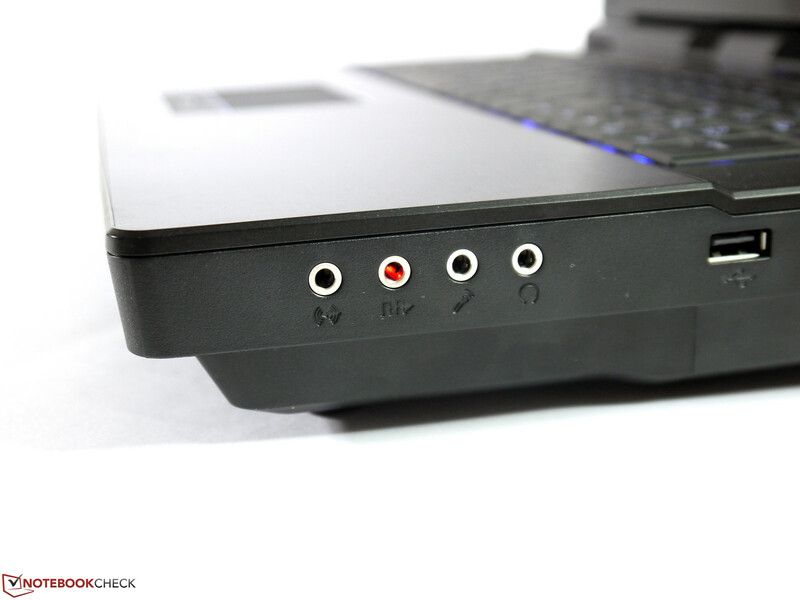 The extensive audio ports including S/PDIF are appealing and allow connecting a 7.1 multi-channel system. 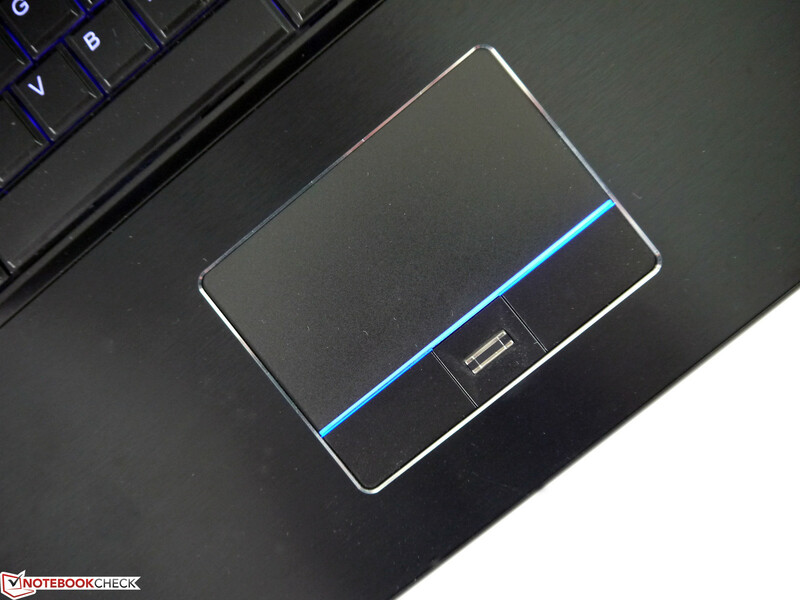 The ExpressCard slot's position is rather unfavorable for practical use. The interfaces on the right are quite limited. Large vents are located on the rear to discharge the waste heat of the power guzzling components. Even FireWire 800 and DVI-I are found here. The XIRIOS W712 sports many interfaces. However, the display's high-gloss finish and the backlit keyboard's adjustable colors in disco-style cannot deny the origin. The casing actually made for the consumer range is mostly unadorned. In return, it provides very high-performance and extensive configuration options. It has a weight of good 6 kilograms and its dimensions are also record-breaking. The screen convinces with overall very good test rates. The keyboard is top-notch, but the touchpad is rather average. Status LEDs (still with a protective sheet) for the charge state are located on the front right. The power button has to be pressed a bit longer than usual. 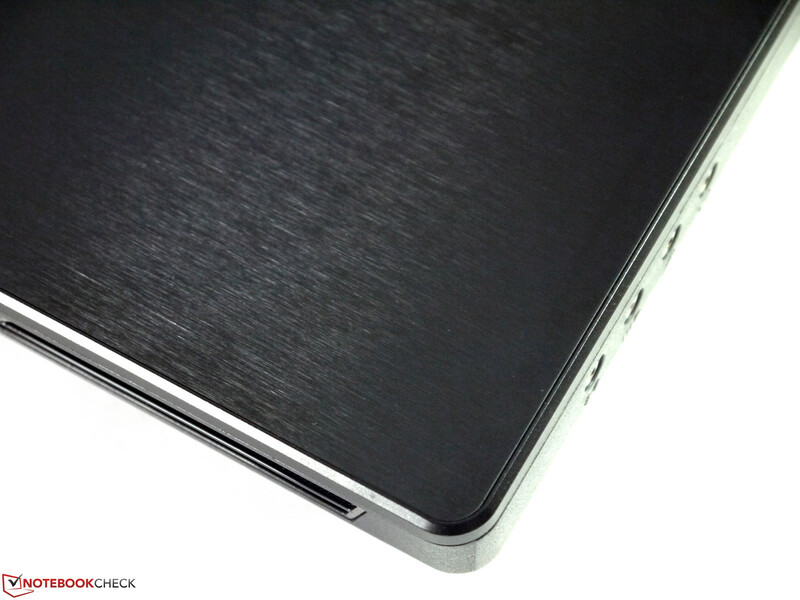 The stylish brushed metal finish is susceptible for fingerprints and dust. The LED status bar is quite bright in the dark and is also reflective. 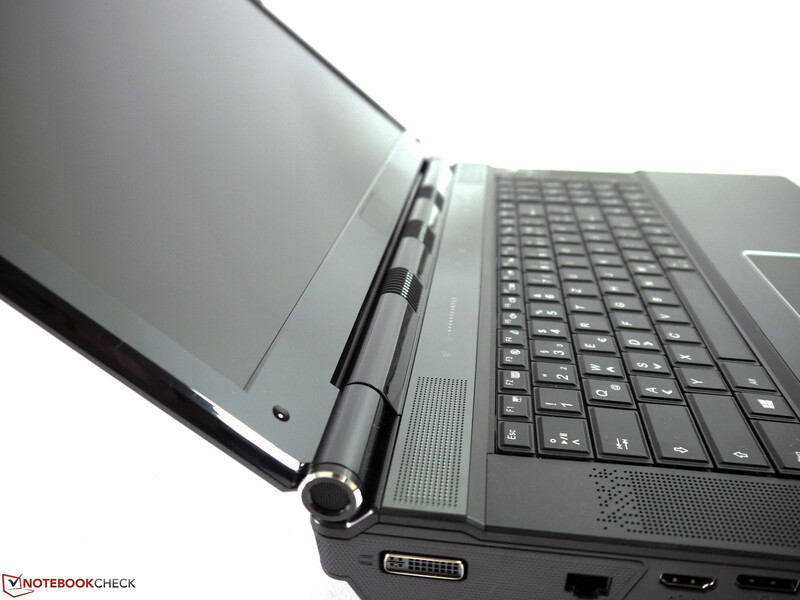 The display hinge has a firm hold on the screen. The webcam has a resolution of 3 megapixels. The display's maximum opening angle is limited. At least a fingerprint reader is located between the touchpad keys as a genuine business feature. 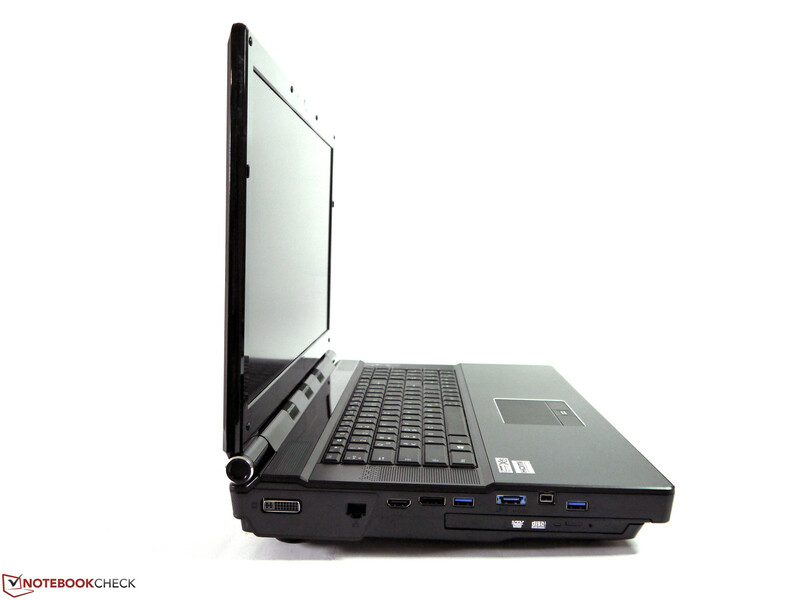 The high computing and graphics performance, the lush connectivity and the extent of freely configurable components. The keyboard and screen prove to be very good user interfaces. A much lower operating noise, an unreflective display bezel and optional mobile CPUs. That so many components can be built into a laptop. 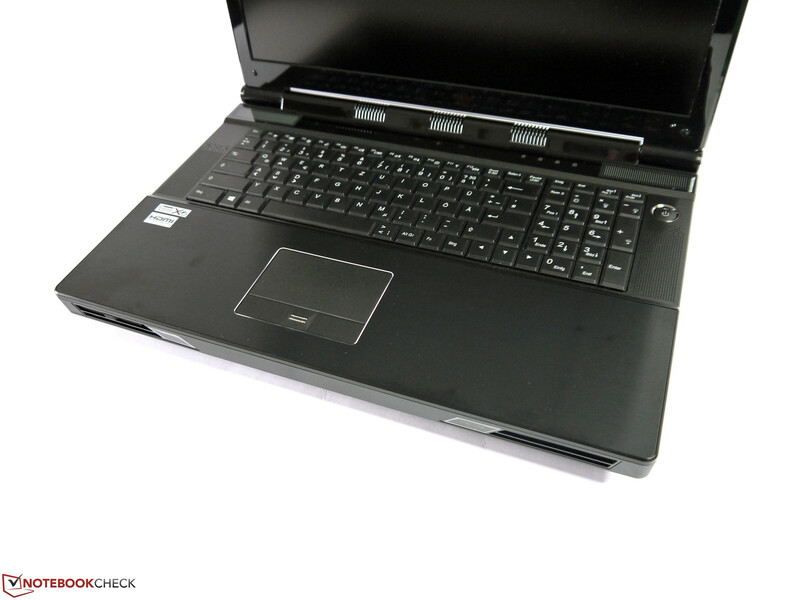 Primarily, high-performance mobile workstations from the 17 inch category: Dell Precision M6700, HP EliteBook 8770w, Bullman E-Klasse 4 i7 or Fujitsu Celsius H920.